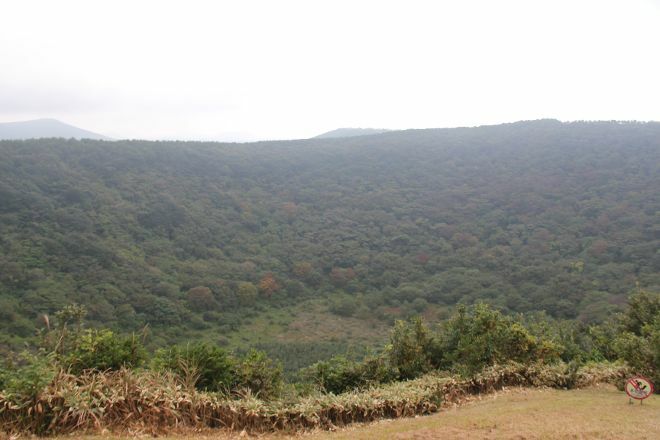 Often described as a natural stadium packed with thick shrubs and magnolia, maple, and pine trees, Sangumburi Crater is home to over 400 plant and animal species. A natural monument and the only one of its kind in the country, the crater erupted violently and quickly without ejecting much lava, leaving a 130 m (426 ft) deep hole. A short walk up the hill along a well-paved path leads to a small pavilion, with the main observation platform offering panoramic views of the ocean, the mountain, and other volcanic "oreums" (parasitic cones) nearby. Walk around the rim and look for Jeju burial mounds surrounded by trapezoidal stone walls and guarded from evil spirits by little stone figures. Use Inspirock's suggestions to plan your Jeju trip and find the best activities and attractions for your vacation. Sangumburi crater is so enchanting. Its golden yellow color and wind blows very fitting merged in this place. Become a favourite location for the photo session. Enjoy nature while walking casually. There is a dining restaurant in front of the entrance. Are clean.